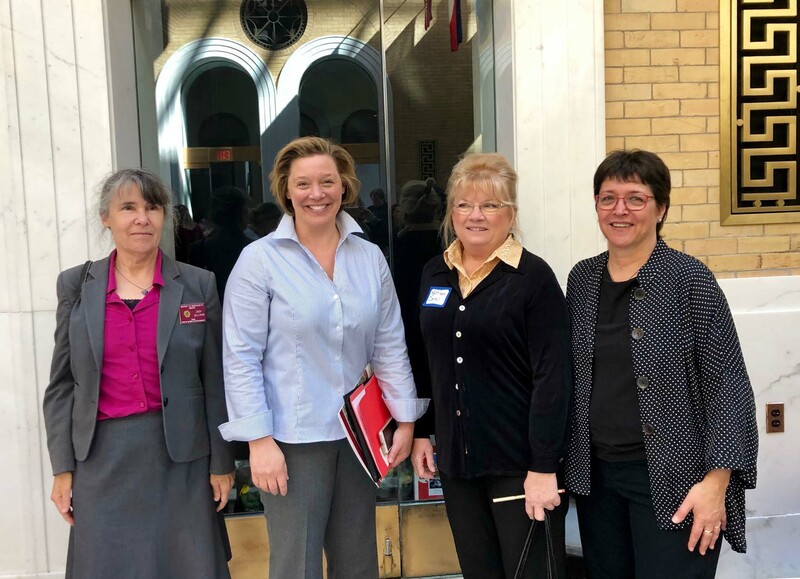 Wednesday, March 27 was Agriculture Day on Beacon Hill. It’s a day when legislators and legislative staff get to meet with farmers and other members of the agricultural community to hear about the issues important to them. It’s also a day when everyone gets to eat a delicious meal made from locally-grown ingredients (and cooked by students from one of the state’s agricultural-vocational high schools) and sample Massachusetts’ specialty food items, including but not limited to maple candy, cranberries, cheeses, apple pie (very popular! ), oysters, ice cream and more. Some of the bills currently in the legislature that the agricultural producers were speaking to their legislators about included ones encouraging the use of renewable energy on agricultural land, redefining hemp as a horticultural crop (allowing farmers to retain the benefits of Chapter 61A while growing hemp), and long-term stabilization of the Health Incentives Program, or HIP, which doubles SNAP recipients’ purchases fresh fruits and vegetables directly from farmers. 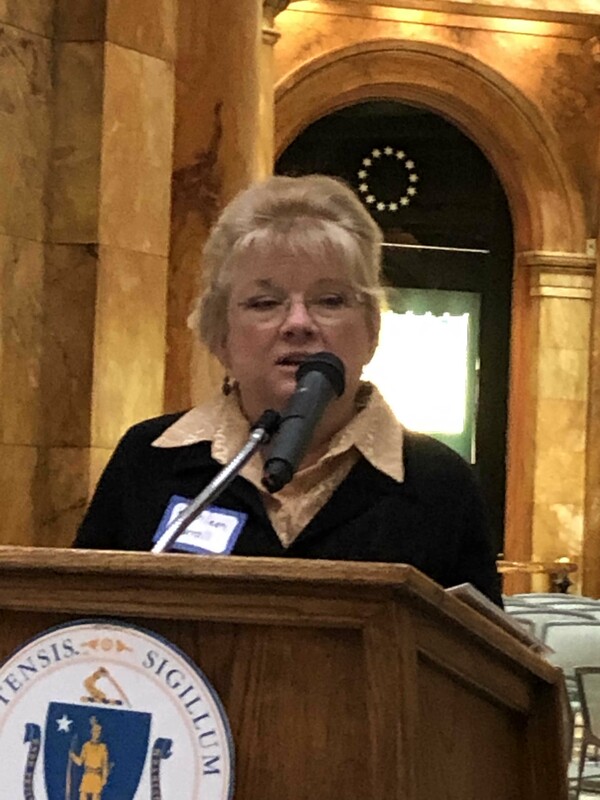 During the speaking program, UMass Extension’s very own recently-retired longtime leader of our Agriculture and Commercial Horticulture program, Kathy Carroll, was recognized for her 44 years of service to Massachusetts agriculture with one of this year’s Agriculture Awards. 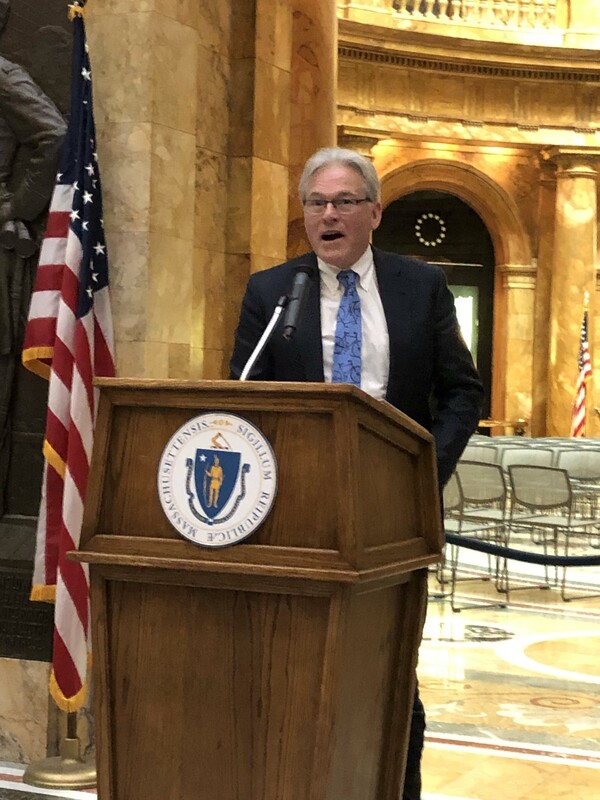 Also, former department head Dan Lass, of the Department of Resource Economics, was presented another of the awards for his work on agricultural land values over many years. 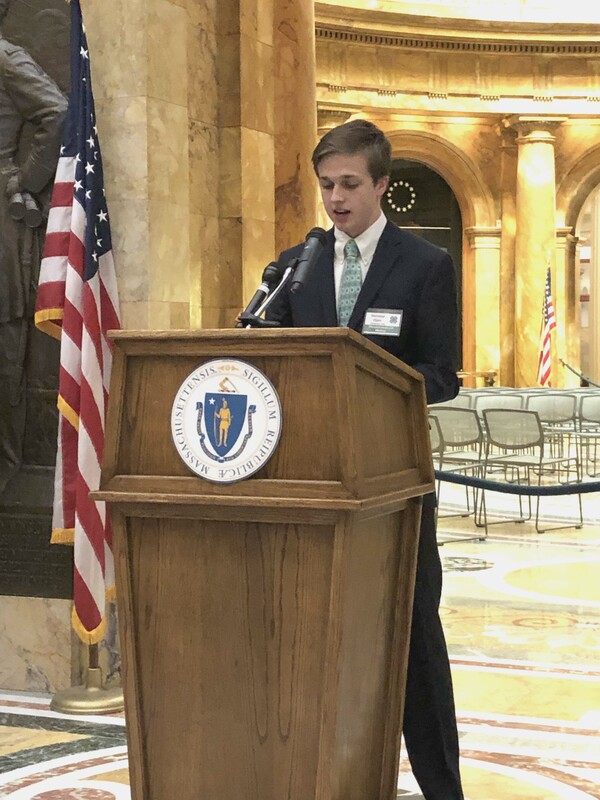 Youth 4-H member Nicholas Ryan of Cohasset received the morning’s biggest round of applause for his stirring talk on youth and the future of agriculture. 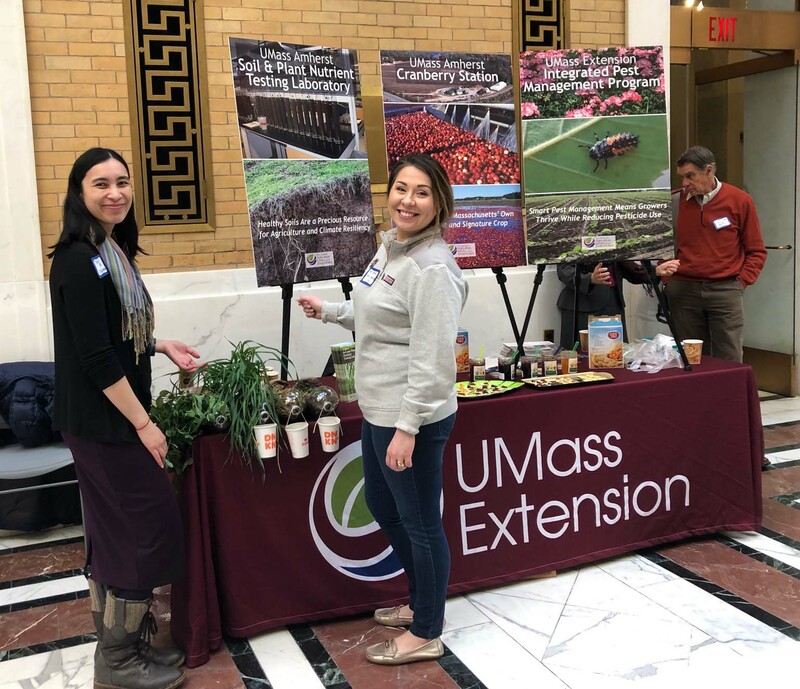 Our own UMass Extension was there serving up samples of jams and jellies from the UMass Cold Spring Orchard and talking about soils, the UMass Cranberry Station, and integrated pest management. The booth was staffed by Samantha Corcoran-Glaze, grad student in the Stockbridge School, Melissa Ocana, climate adaptation coordinator for Extension, Hilary Sandler, director of the UMass Cranberry Station, and CAFE administrative staffers Sandy Thomas and Laura Hall. 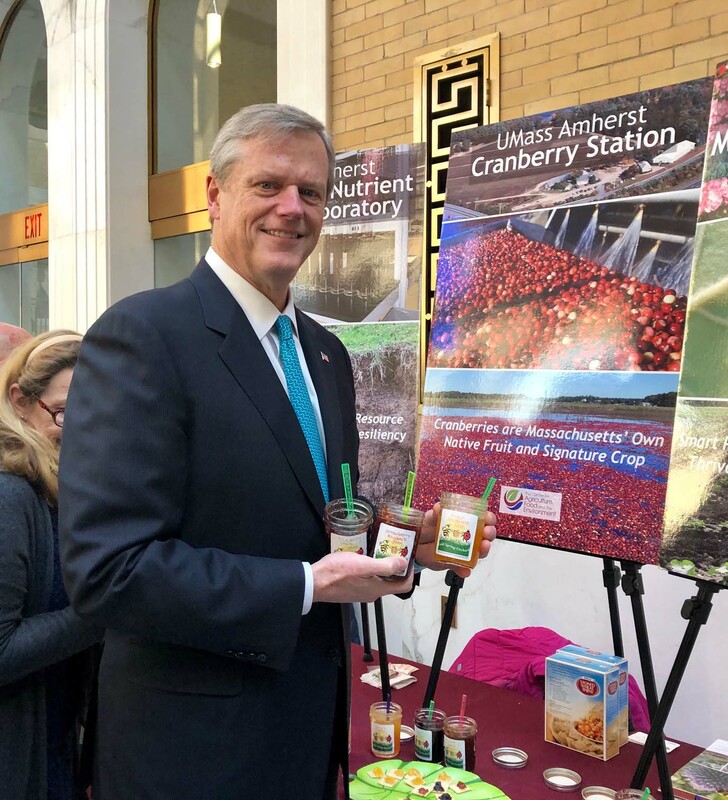 Governor Charlie Baker and Lieutenant Governor Karen Polito sampled some of the colorful jams and jellies when they stopped by the booth.